The following text is taken from Speaking Notes prepared in advance of a special public meeting (September 27/12), hosted by the City of Greater Sudbury's planning staff, as part of the City's 5-year review of our Official Plan. The review has been on-going for sometime. Planning staff had previously identified a number of issues with the OP for which citizen input and review were sought, including active transportation, development on lakes at capacity, etc. One of the items which has worked its way onto the input/review agenda appears as a result of direction given to staff by Council: to assess how existing rural severance policies can be loosened to facilitate more development in rural areas. The September 27/12 special public meeting was the first public opportunity for input on rural residential development. In response, I put together the following oral presentation, some of which I have stolen from previous blogs which I've written on the subject (especially my earlier four part series, "Greater Sudbury at a Crossroads", appearing in late May/early June of this year; here are "Part 1: Looking Backwards and Moving Forwards"; "Part 2: The Importance of the Decision Making Process"; "Part 3: Planning to get Around in the City of Tomorrow"; and, "Part 4: Towards a Green City"). I have previously blogged about this issue in February, 2012 ("Why Restricting Rural Residential Development in Greater Sudbury Makes Sense") and in August, 2011 ("Exurban Development in Greater Sudbury: Fiscally Irresponsible, Environmentally Unsustainable"). This presentation was not a popular one tonight. Most people at the meeting were rural landowners who have been frustrated by existing development policies. In all fairness, though, I have to say that many speakers were simply looking for a more balanced approach to assessing development. Concerns were expressed as well about the minimum lot size requirements (5 acres). After listening to the speakers tonight, I think it's fair to say that while I am still opposed to loosening existing rural residential development policy in the Official Plan, perhaps there should be greater opportunities to evaluate development proposals on their own merits. That means, though, creating the right policy environment. Right now, policies indicate that you can create from an original parcel up to 3 new lots, as-of-right, as long as they are all 5 acres or greater. A better approach would be to have policies which restrict development in rural areas, unless it can be adequately demonstrated that a single new lot can be created which can support a septic system and well, and which won't lead to negative public health impacts. Policies should spell out the criteria for landowners to follow, while requiring a site-specific amendment to the Official Plan. That may be the sort of balanced approach which I was not contemplating when I put together the following presentation. These speaking notes were provided to municipal planning staff at the public meeting, for their records. Subheaders have been included in this blogpost to hopefully make it a little more readable. 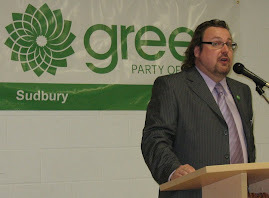 My name is Steve May, and I am a resident of the City of Greater Sudbury, Ward 12. I am here this evening after having reviewed the City’s press release regarding tonight’s meeting. I understand that, as part of the 5-year review of the City’s Official Plan, the City is considering making changes to policies regarding rural residential land development applications. Changes currently being considered, and which are the subject of tonight’s meeting, consist of amending OP policies which would have the affect of lowering the area and frontage requirements for new rural residential lots. It is expected that the lowering of area and frontage requirements will lead to increased opportunities for the creation of rural residential lots. It has been cited that existing Official Plan requirements are prohibiting rural residential development. I believe that the City of Greater Sudbury should seriously entertain the notion that existing policies for rural residential severances need to be changed. Evidence now strongly suggests that our Official Plan’s existing policies are having a detrimental impact on orderly development within the City, as well as a negative impact on the use of the City’s fiscal resources, including those resources derived from municipal taxpayers. Let me be clear: There is no case, no economic, environmental or social case, which can be made which justifies expanding opportunities for the creation of more rural residential lots in the City of Greater Sudbury. No case can be made on the basis of need, either, as demonstrated by the City’s own studies related to land supply and vacant lot analysis. The only case which can be made with regards to changing the City’s Official Plan policies as they pertain to rural residential development is one which adds further restrictions or an outright prohibition on rural residential lot creation in our City. The only case which could possibly be made to allow additional rural residential severances is one which favours the economic interests of private rural landowners over the interests of all other taxpayers. And I would argue that on that basis, it is clearly not within the interests of the City of Greater Sudbury and the vast majority of its residents to shift land development policies in a direction which financially disadvantages the majority of citizens. It is well known that the true costs of rural residential development make this form of development activity the most expensive type for taxpayers to maintain over time. Rural residential development is inefficient and costly, and it is subsidized by other taxpayers. The maintenance subsidy is a drain on our scarce resources, which would clearly be better spent providing the sorts of services which the citizens can derive a net benefit from. Academic and real-world studies, on which sound planning principles and practices are based, have shown time and again that restricting rural residential development makes sense for a community, for a number of reasons. These reasons may be related to land use compatibility issues in the rural area, related to resource extraction and tourism, and the preservation of lands for agricultural activities and uses. Reasons given for restrictions are also related to minimizing requirements for the expansion of services and infrastructure. These reasons are well-known, and land use policies throughout Ontario and here in Greater Sudbury acknowledge the need to limit residential development outside of well-defined settlement areas. What is not as well-understood, but which is becoming increasingly apparent, is that there are other impacts from rural residential development which should be considered when land use policy is being developed. These impacts are related to resource depletion, climate change, and creating the conditions for local economic prosperity. Our economic prosperity will be determined by how successful we are at planning for and creating communities which meet our anticipated future needs. A city which provides opportunities for people and businesses to thrive in a low-carbon economy will be a better place for all of its residents. In the City’s Growth and Settlement Background Report and Issues Paper, dated May 28, 2012, the City advises that Greater Sudbury will experience modest growth over the next two decades, with a population rising from the existing 160,274 (in 2011) to 170,680 people in the year 2032. Coupled with a declining household size, we can expect the need for an additional 4,400 dwellings over the next 20 years. Is the City prepared to meet the needs of tomorrow’s residents? The answer is buried in the Growth and Settlement Background Report. When the Official Plan was first put together in 2006, population was forecast to rise to around 170,000 by the year 2021. Now, after 5 years, recent analysis has shown that we are generally on target for a modest increase in population, albeit perhaps at pace which is a little slower. The Growth and Settlement Background Report, which projects a need for an additional 4,400 units to accommodate a population of approximately 170,000, indicates that there is a need to increase the number of households annual by approximately 220 units. The Report indicates that this annual increase is far smaller than the increase which the City has actually experienced over the past 5 years. Although our needs for new households are modest, we’ve been creating almost 600 new dwelling units a year. Clearly, when we look at the real needs of our City, the pace of current development activity is at a level far greater than our needs require. While this level of activity is sure to provide Sudburians with greater choice in the future, likely coupled with lower house prices due to an over-saturated market, it can not justify changes to land use policy which encourage yet more development. In fact, the breakneck pace of development which we’ve been experiencing can only justify a further tightening of development policies, and in particular, those policies which facilitate development in areas which don’t make sense. Beyond the 600 annual new dwelling units per year created over the last 5 years, we’ve seen extensive development proposals for approximately 1,000 units in the Minnow Lake area, and hundreds of other units along the Paris/Long Lake Road corridor. Simply put, Greater Sudbury has no need to loosen development policies, and facilitate the creation of more residential lots outside of urban areas. While some will argue that it is incumbent upon the City to allow residents to determine the best locations in which to live, the argument doesn’t hold up for a number of reasons. First, the Growth and Settlement Background Report identifies that there already exists 475 existing vacant residential lots in the rural area. The Report goes on to clearly identify that at current rates of take-up, this existing vacant lot supply could last up to 50 years. With such a healthy supply of vacant lots already in existence for residential development, there is clearly no need to create more! The second reason goes back to what I was discussing earlier, and it has to do with the true costs of rural residential development, and how these costs are disproportionately borne by municipal taxpayers. Rural residents have few choices when it comes to accessing services and infrastructure. Just this past week, there was a letter to the editor of the Sudbury Star complaining about the traffic in this City. And there have been numerous stories about the cost of road maintenance. What is clear are that the choices which are made with regards to development form have contributed to existing situations. With the knowledge that creating car-dependent communities contributes to traffic congestion and road maintenance costs, it only makes economic sense to create complete communities which offer residents broader choices when it comes to transportation. Lately, Greater Sudbury has been doing just that. Denser subdivisions, infilling within existing urban areas, and facilitating the creation of second units within existing homes – all of these efforts go towards creating the type of community we need to thrive in the emergent low-carbon economy. Further, infrastructure costs related to this form of development are significantly lower because of the reliance on existing infrastructure, and where tax dollars have to be spent for improvements, there is a higher critical mass of residents who receive the benefit. Some might say that’s fine, but what does it hurt to allow people the choice to develop in rural areas? The truth, however, is that since we can expect only a limited increase in population, it only makes sense to do the best job that we can to derive the greatest net benefit from this limited increase. If we know that we need only 4,400 dwellings to meet our 20 year needs, it would be best to focus the vast majority of those dwellings within areas where they will bring the largest benefit to the community. And those areas are within existing settlement areas, where transit-supportive communities can thrive. Knowing that only a limited number of new people are coming to our City, it makes no sense to encourage opportunities for those new people to spread out into rural areas, where the costs of servicing are so much higher. In Greater Sudbury, urban taxpayers already subsidize rural landowners to a significant degree through the costs of road building and maintenance, and the provision of emergency services to remote parts of the City. It’s not just the roads in the rural areas, either. Rural commuters add to the urban congestion which the rest of experience in the form of traffic, because of the car-dependent nature of rural development. Vast parking lots for commuters occupy critical public lands – these parking wastelands could be better used to facilitate commercial and industrial expansion, but instead parking lots are taxpayer-subsidized short-term rental properties for car culture convenience. These are the sorts of costs which increase due to development form. Car-dependent development also carries high health, environmental and social impacts. Better development options are those which seek to offer the greatest level of lower carbon alternatives for transport, and which are based on the principles of smart growth. Generally speaking, Greater Sudbury seems to understand that healthy communities are worth aspiring too. This proposal, which seeks to encourage rural residential development, would be a fundamental step backward in building the sort of community which we need to meet the economic challenges of the 21st Century. The impacts which a higher level of rural residential development will have on servicing and infrastructure needs cannot be tolerated by taxpayers. To reiterate, there is no economic, social or environmental case which can be made for loosening existing restrictions on rural residential development. No case can be made on the basis of need, either. I have made this submission before, and I will make it again. Instead of looking at changing policies in the Official Plan to facilitate more rural residential development, our municipal Council should be looking towards greater restrictions, or an outright policy prohibition. In these lean economic times, our decision-makers must take greater care with how public monies are spent, and on decisions which lead to long-term costs. Being that there is no case for continuing to allow this expensive development form, I urge our municipal councillors to take a very close look at the long-term costs of facilitating any more residential development in our rural areas, especially given the 50-year supply of existing vacant lots in the City. The choices we make today in Greater Sudbury are going to reverberate throughout our collective future like ripples from pebbles tossed into a pond. It’s therefore important that we get things right the first time, at least as best as we can. Decisions should be made based on the best information available at the time. Ideally, decisions should lead to the creation of the most benefit for those making the decision. Let’s continue to invest public dollars where it makes sense to do so. Facilitating costly rural residential development, however, is not a wise use of public money.